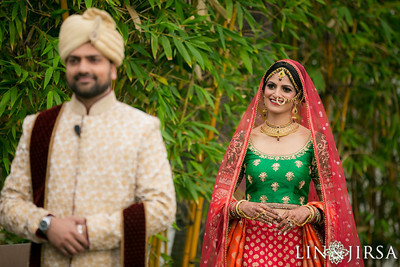 A key component of any Indian wedding photoshoot is the First Look. 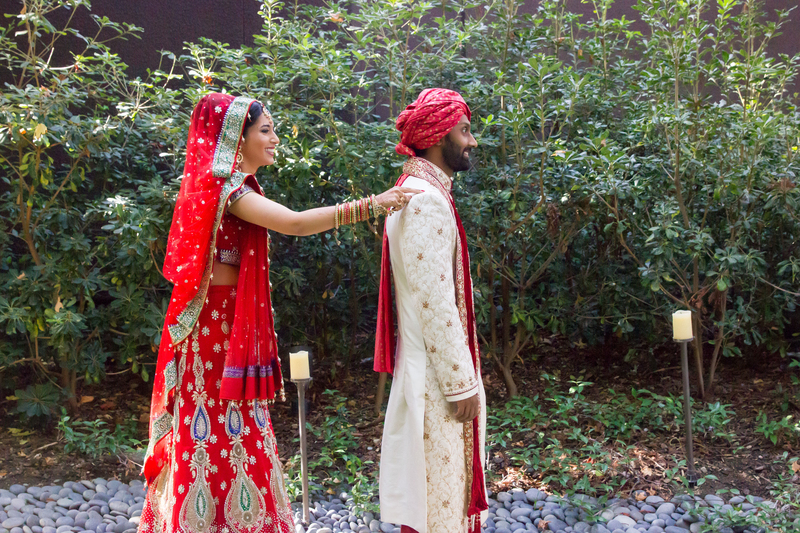 That anticipatory moment when you see each other for the first time on your wedding day – both dressed in your best – in iconic Indian wedding attire. 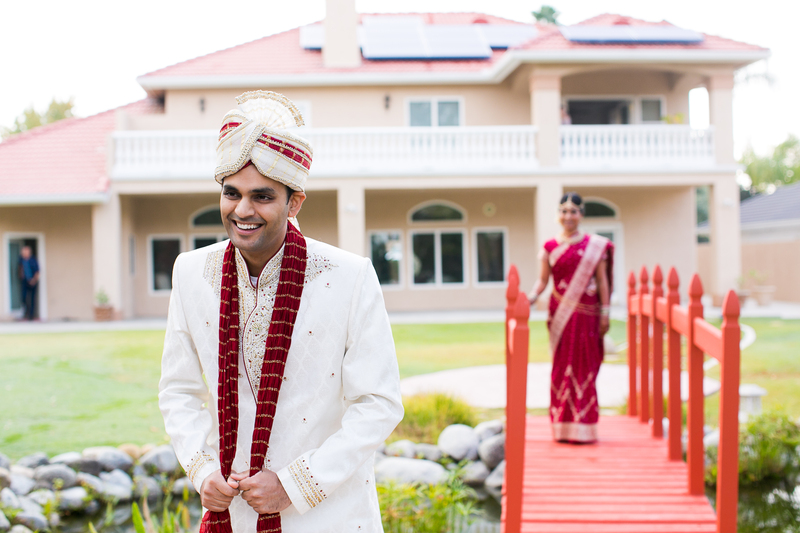 Your wedding venue plays a crucial role in the First Look – where, at the venue, do you want your First Look to be? What background? Will there be other people around? 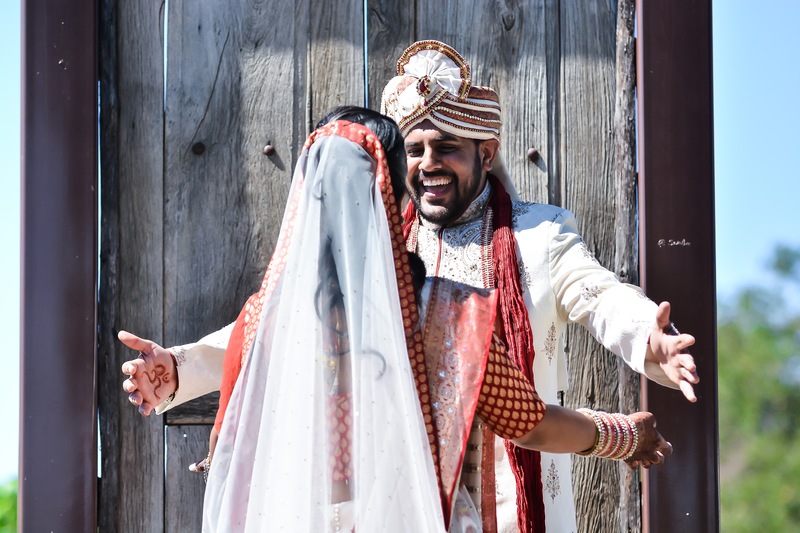 In all of the photos below, the photographer carefully scoped out the venue and planned where to capture this memorable moment so that each couple can relive it every time they see their photos. 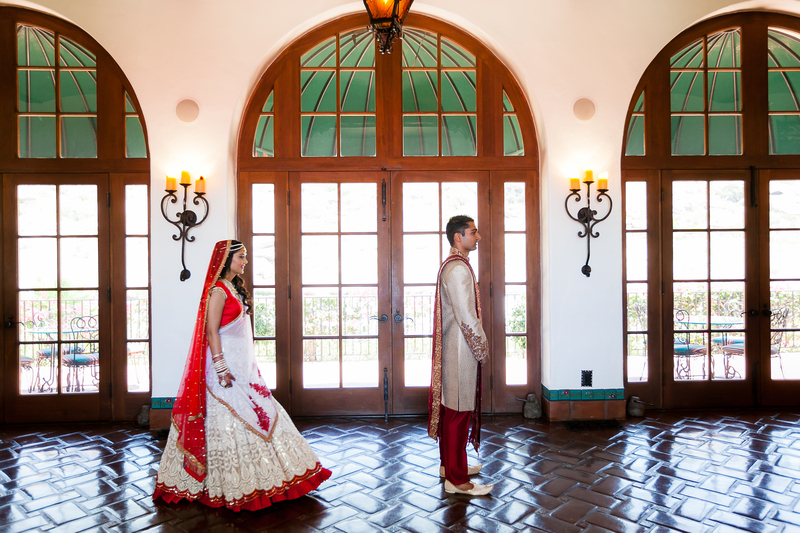 Palak and Vaibhav got married at the Hotel Maya in Long Beach, California. 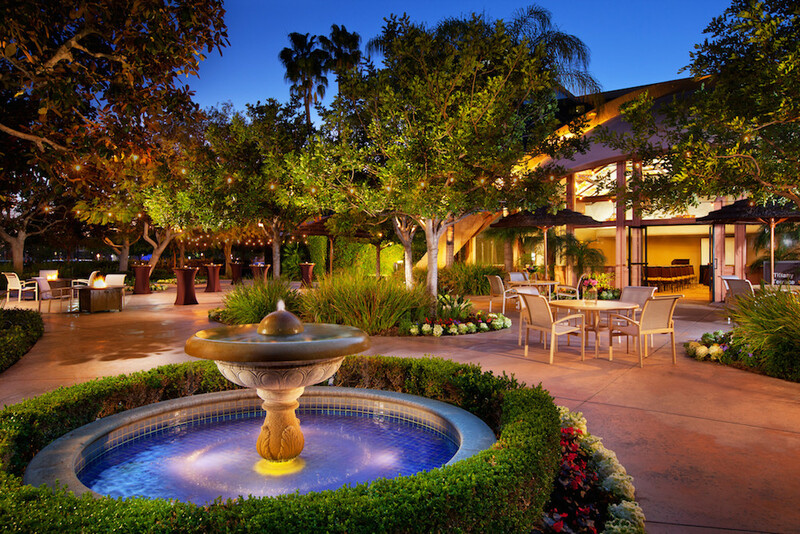 Hotel Maya is a waterfront hotel with a few venues overlooking the water, so there are several great places around the property for couples to select for First Look photos. 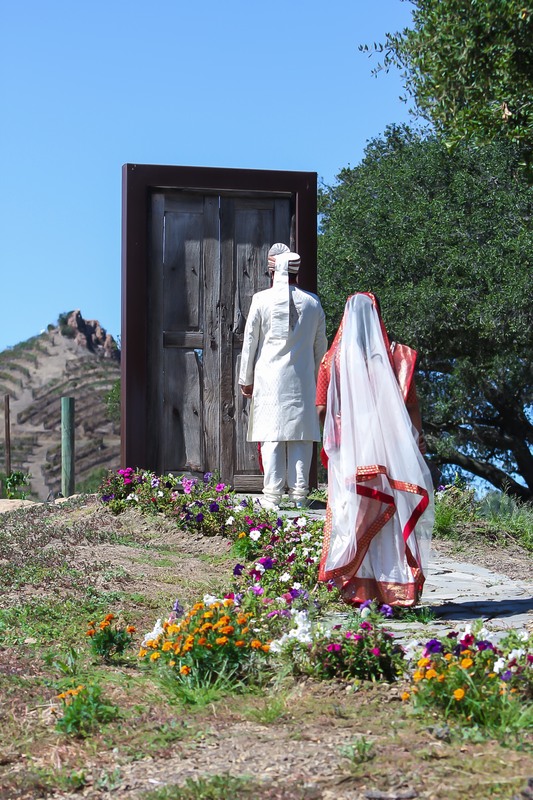 Palak and Vaibhav are on the baraat path, right next to the water. Click for their full wedding feature. 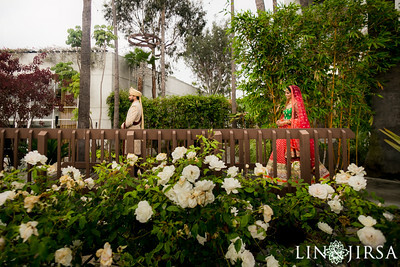 Poonam and Jayson got married at the Hilton Anaheim. 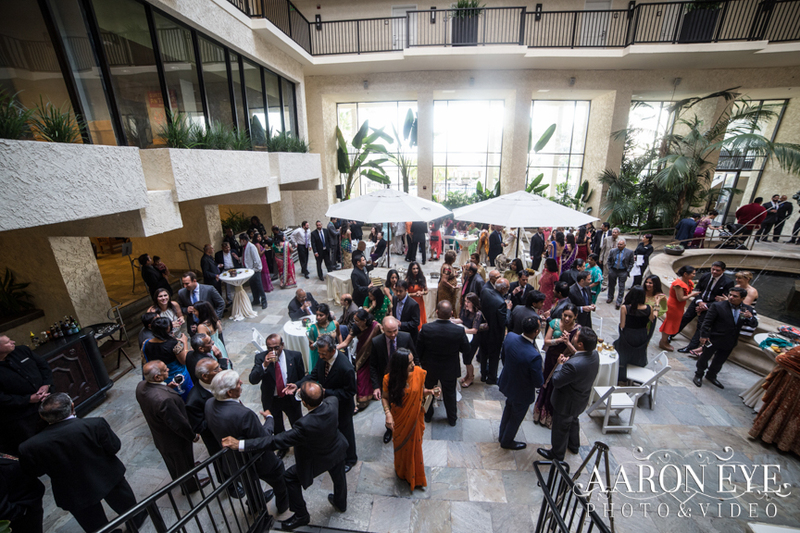 They chose that venue for the multi-levels that the hotel offered so every event felt special and unique. Amish patiently waited while I got ready and we did our first look before the ceremony started. 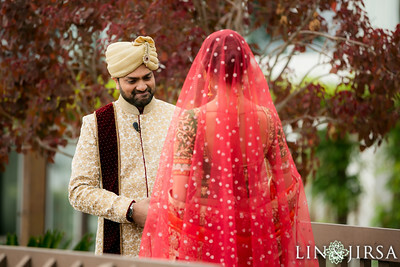 Tejal and Yousouf’s oceanfront wedding in Huntington Beach, California was at the newly expanded Hilton Waterfront Beach Resort. You can see the beach in the background as well being surrounded by beautiful palm trees for their First Look. Be thoughtful about where, at your wedding venue, you select for First Look photos. Personalize the First Look photos and make them memorable for you. 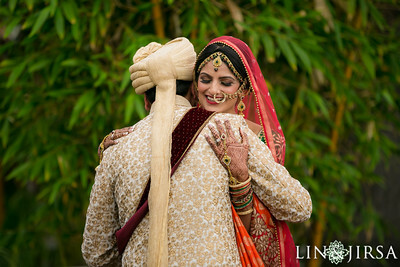 Next Next post: Mala + Sandeep’s Indian Wedding, The Journey From the Dance Floor to the Mandap!